(CNN) -- The pilot of a tanker that crashed into the San Francisco Bay Bridge in 2007, causing a major oil spill, was under the influence of multiple prescription medications that impaired his judgment, federal officials said in a report Wednesday. The November 2007 crash left a gash in the tanker's side and led to an oil spill that killed more than 2,000 birds. The National Transportation Safety Board said the pilot of the Hong Kong-registered Cosco Busan, was "medically unfit" on November 7, 2007. That, and a master pilot's poor oversight of his performance, were major factors in the crash that dumped 53,000 gallons of oil into the bay, the NTSB said. "How a man who was taking a half-dozen impairing prescription medications got to stand on the bridge of a 68,000-ton ship and give directions to guide the vessel through a foggy bay and under a busy highway bridge is very troubling," said acting NTSB Chairman Mark V. Rosenker. The pilot, John Cota, was charged with criminal negligence in federal court last year. He faces two misdemeanor charges that could result in up to 18 months in prison and $115,000 in fines. 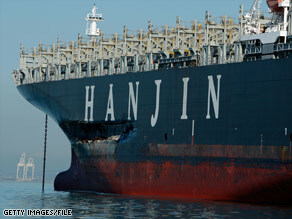 The 901-foot ship left Oakland, California, en route to South Korea when Cota gave orders that steered the ship directly toward a support tower on the bridge. While the ship avoided a direct hit, it hit a support system at the tower's base, cutting a 212-foot gash in the ship's side, the NTSB said. The board ruled that Cota and Chinese master pilot Mao Cai Sun never thoroughly discussed a plan before they took off on a foggy night when visibility was less than a quarter-mile. The oil spill killed about 2,500 birds of 50 different species, according to the report. The crash caused more than $70 million in environmental cleanup costs, $2 million in damage to the ship and $1.5 million in damage to the bridge. The report also blamed the ship's operator, Fleet Management Ltd., for not properly training crew members and the U.S. Coast Guard for not providing adequate medical oversight of the pilot. It said the Coast Guard should have revoked the pilot's license, the pilot should have given a meaningful pre-departure briefing about plans for the voyage and the master pilot should have taken a more active role in ensuring the ship's safety. "There was a lack of competence in so many areas that this accident seemed almost inevitable," Rosenker said.